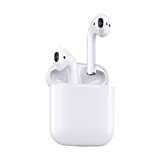 Apple released its cord-free AirPods headphones a long, long time ago and yet new orders placed with the company’s online store STILL aren’t delivered for at least a week. We have no idea how that’s even possible at this point, but it’s embarrassing to say the least. If you want AirPods — and you should, because they’re awesome — please don’t order them from Apple. Instead snag a pair of Apple MMEF2AM/A AirPods Wireless Bluetooth Headphones on Amazon for the same price, and you’ll get free Prime shipping. This way they’ll be in your hands and in your ears within 2 days instead of a week or more.